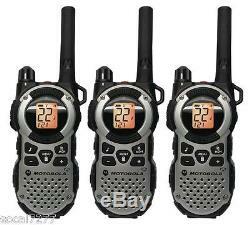 Walkie Talkie s 2 Two Way Radios GMRS Long FRS Talkabout Motorola MT352 Black Gray - 6 PACK. 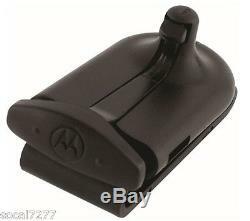 The Motorola Talkabout® MT352 series is the recommended choice when it comes to battery life performance. It has up to twice the amount of battery life than compared to the standard NiMH rechargeable battery pack. Its perfect for active outdoor excursions or lifes every day adventures. Take a pair on your next hunting, camping or hiking trip and stay connected in any season. With a range of up to 35 miles and freedom to communicate wirelessly, the MT352TPR won't slow you down. The range in real-life conditions can be reduced from maximum range. How far can I expect my radios to communicate? The communication range quoted is calculated based on an unobstructed line of sight test under optimum conditions. Actual range will vary depending on terrain and conditions, and is often less than the maximum possible. Your actual range will be limited by several factors including, but not limited to: terrain, weather conditions, electromagnetic interference, and obstructions. Extended Life Batteries Enjoy hours of uninterrupted outdoor activities. The MT series provide maximum battery life in a small package and is designed to withstand hours of extended usage providing users with up to 15 hrs of talk time. 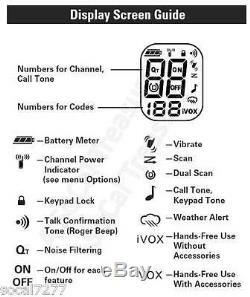 Its emergency alert feature, built-in LED flashlight and NOAA weather alert channels provide a total emergency preparedness communication solution. Talkabout Clear Boasting a high efficiency class D amplifier, the MT series radio delivers enhanced sound quality by reducing distortion at high volumes. Extra Power When You Need It Most Push-to-Talk Power Boost, when activated, allows you to extend the transmission range by increasing the transmitter power output while saving battery life when no power boost is necessary. Hands-free Communication When you are hiking up a steep mountain trail, you really need to keep your hands free to brace the rocky terrain. With iVOX acting like a speakerphone and allowing hands-free communication, you can keep on moving without stopping to answer a call. Easy Charge Designed to fit every lifestyle, the MT350TPR allows you the convenience of charging many distinct ways. Use the provided mini-USB charger for portable convenience, great for charging at home or to take along to recharge in a hotel. While on the go, you can use our mini-USB car charger. If you are not on the move, the desktop charger is a good option or simply use a mini-USB PC cable to charge from your PC when no power outlet is available. If none of these options are available, you can simply drop in standard alkaline batteries and youre ready to start talking. 22 Channels, each with 121 Privacy Codes. NOAA Weather Channels and Alerts. This listing for MT352TPR includes 1 Sets for a total of: 6 radios 6 rechargeable battery packs 2 Y cable wall adaptem with 2 mini- USB connectors and 2 wall adaptor with a single mini-USB connectors 6 belt clips 6 PTT earbuds. Weekend orders will be processed on Monday. 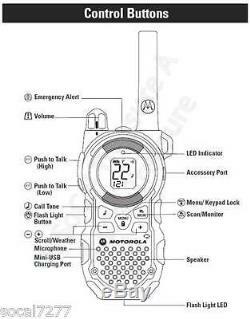 The item "Talkabout Motorola Walkie Talkie s 2 Two Way Radios GMRS Long FRS MT352 TPR 6PK" is in sale since Tuesday, December 01, 2015. 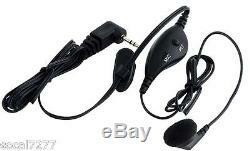 This item is in the category "Consumer Electronics\Radio Communication\Walkie Talkies, Two-Way Radios". The seller is "socal7277" and is located in Ladera Ranch, California. This item can be shipped to United States, to Canada, to United Kingdom, DK, RO, SK, BG, CZ, FI, HU, LV, LT, MT, EE, to Australia, GR, PT, CY, SI, to Japan, SE, KR, to Taiwan, ZA, TH, to Belgium, to France, to Hong Kong, to Ireland, to Netherlands, PL, to Spain, to Italy, to Germany, to Austria, RU, IL, to Mexico, to New Zealand, PH, SG, to Switzerland, NO, QA, HR, TR, CO.